The A.I. Experience: Welcome to High School! 2012-2013. 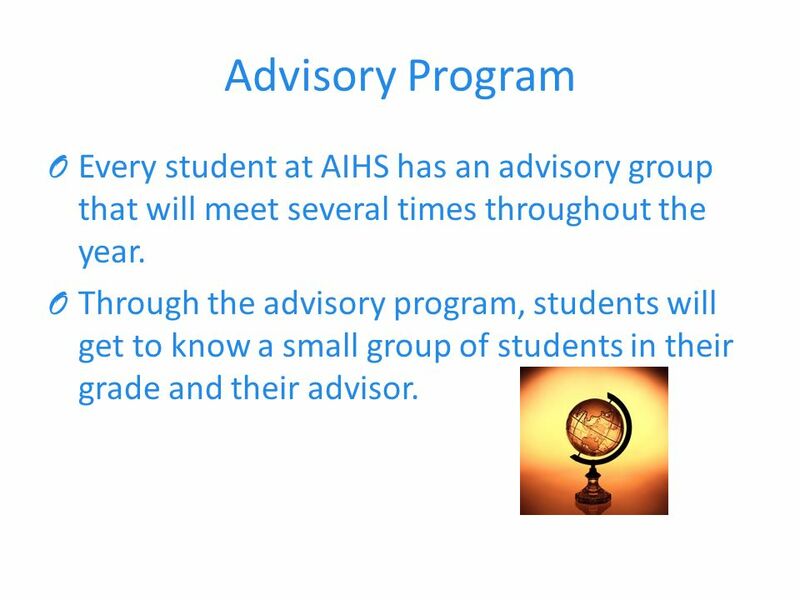 7 Advisory Program O Every student at AIHS has an advisory group that will meet several times throughout the year. 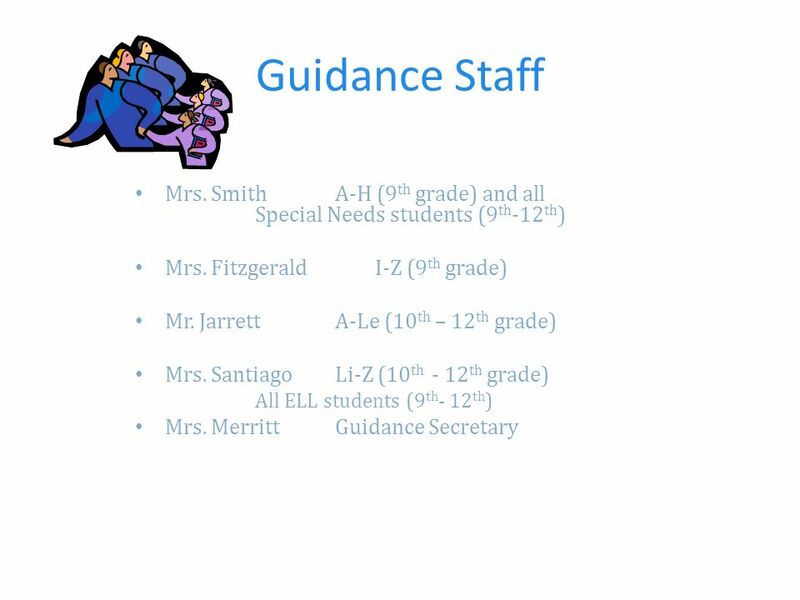 O Through the advisory program, students will get to know a small group of students in their grade and their advisor. 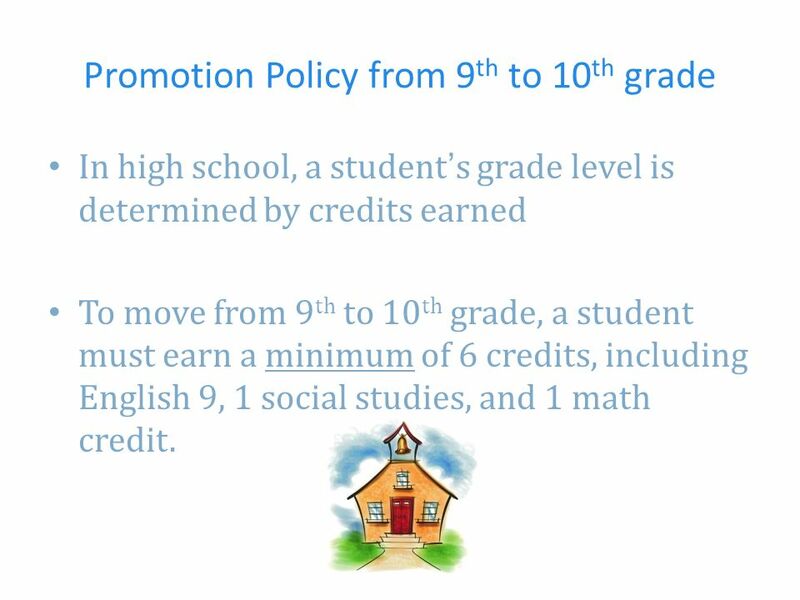 8 Promotion Policy from 9 th to 10 th grade In high school, a students grade level is determined by credits earned To move from 9 th to 10 th grade, a student must earn a minimum of 6 credits, including English 9, 1 social studies, and 1 math credit. 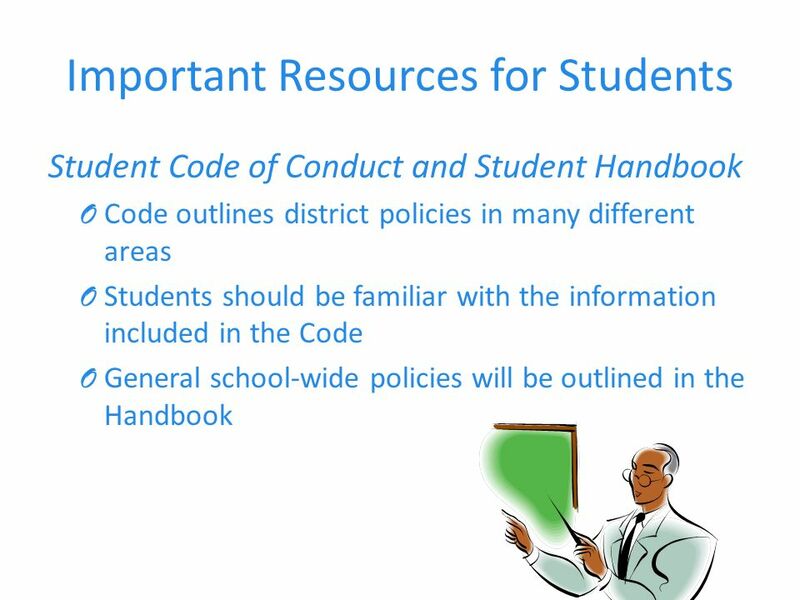 9 District Attendance Policy Regular school attendance is crucial for a students success in school. 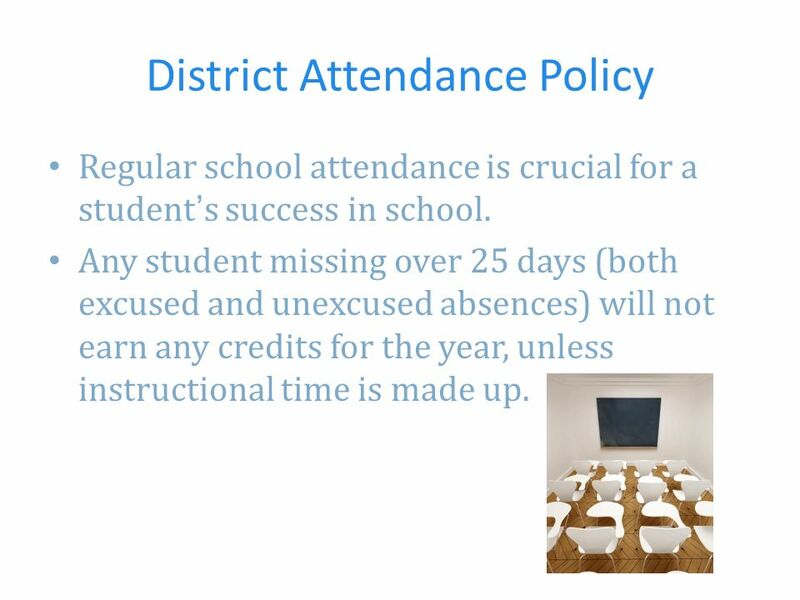 Any student missing over 25 days (both excused and unexcused absences) will not earn any credits for the year, unless instructional time is made up. 11 Planning Ahead... In selecting courses, colleges want to see that students are challenging themselves in light of what our school offers. Colleges also want to see that students are being successful in their courses. 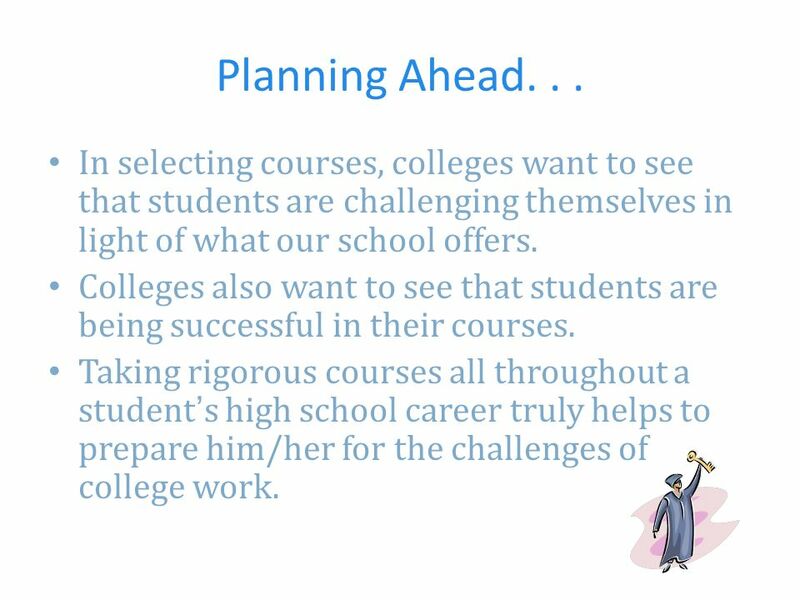 Taking rigorous courses all throughout a students high school career truly helps to prepare him/her for the challenges of college work. 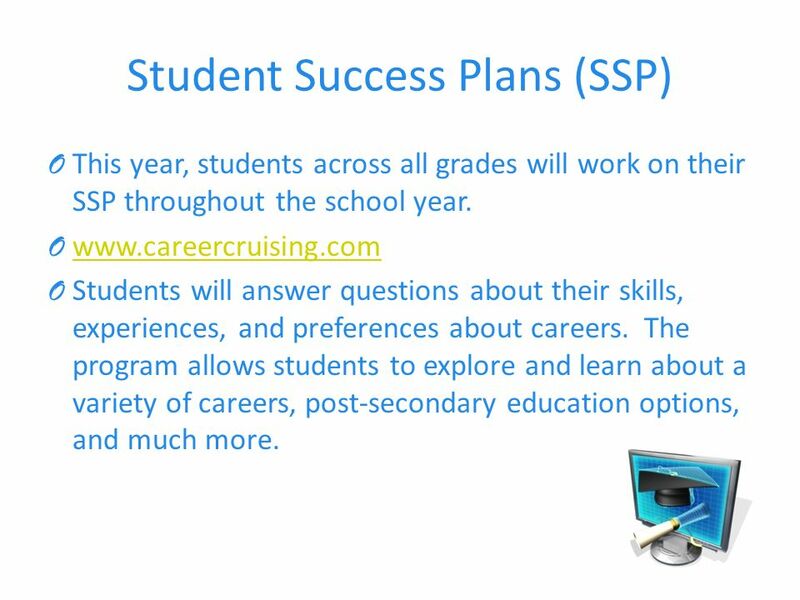 12 Student Success Plans (SSP) O This year, students across all grades will work on their SSP throughout the school year. O www.careercruising.com www.careercruising.com O Students will answer questions about their skills, experiences, and preferences about careers. The program allows students to explore and learn about a variety of careers, post-secondary education options, and much more. 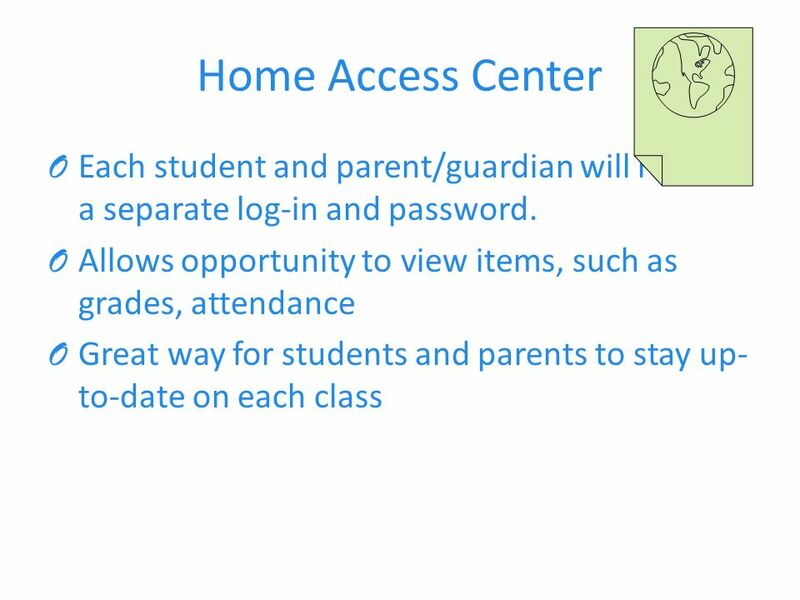 13 SSPs O Students and parents can access an SSP from any location with internet access by using their personal login. O Many helpful resources are available on the site, including information on colleges and careers and a resume builder. 14 Supports for Students O Tutoring Program for after-school assistance O Library/Media Center O Hours available before and after-school O Students can conduct research, use computers, read, study, etc. 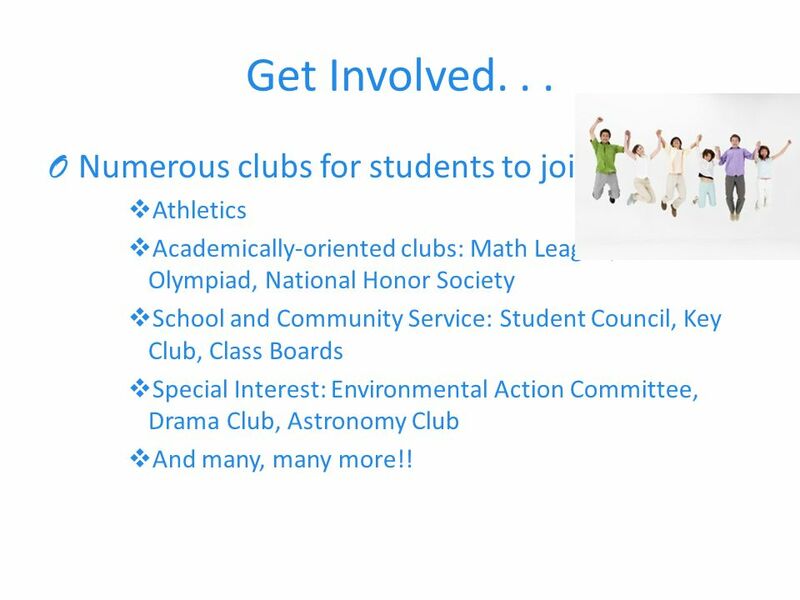 15 Get Involved... O Numerous clubs for students to join Athletics Academically-oriented clubs: Math League, Science Olympiad, National Honor Society School and Community Service: Student Council, Key Club, Class Boards Special Interest: Environmental Action Committee, Drama Club, Astronomy Club And many, many more!! 18 Just remember... O We are all here to help! 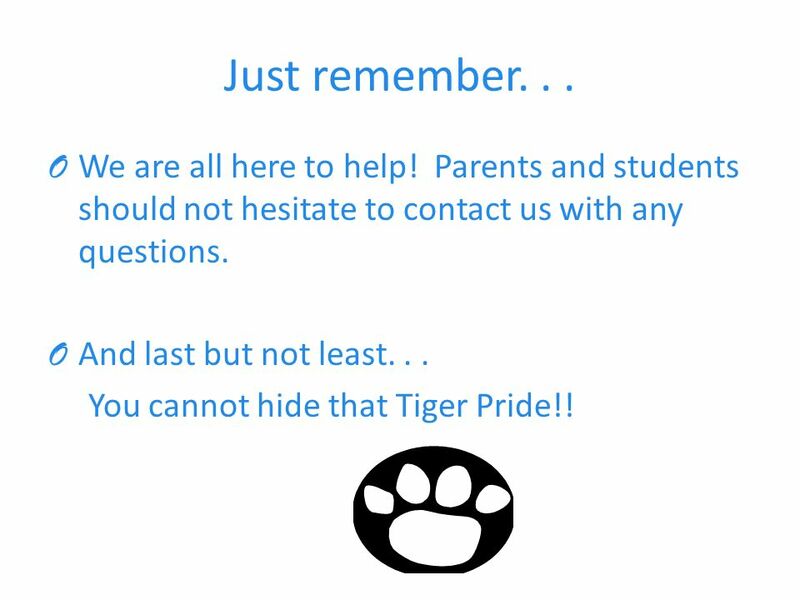 Parents and students should not hesitate to contact us with any questions. O And last but not least... You cannot hide that Tiger Pride!! 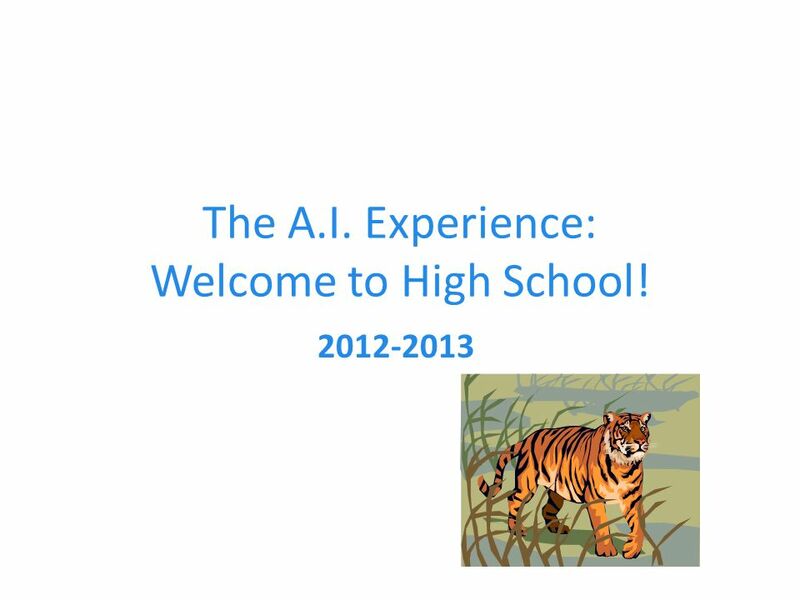 Download ppt "The A.I. Experience: Welcome to High School! 2012-2013." IT’S GREAT TO BE A SPARTAN!! Freshman /Sophomores Guidance Presentation. 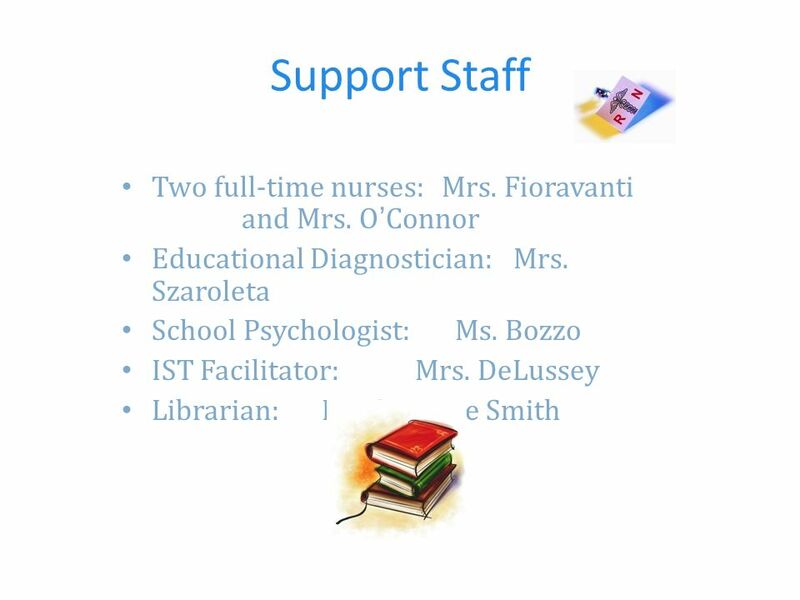 Guidance Counselors A-ZESOLMs. Torres A-Z9 th onlyMs. Zaremba A-C10-12Ms. Russell D- G10-12Mr. Boettcher H-MA. 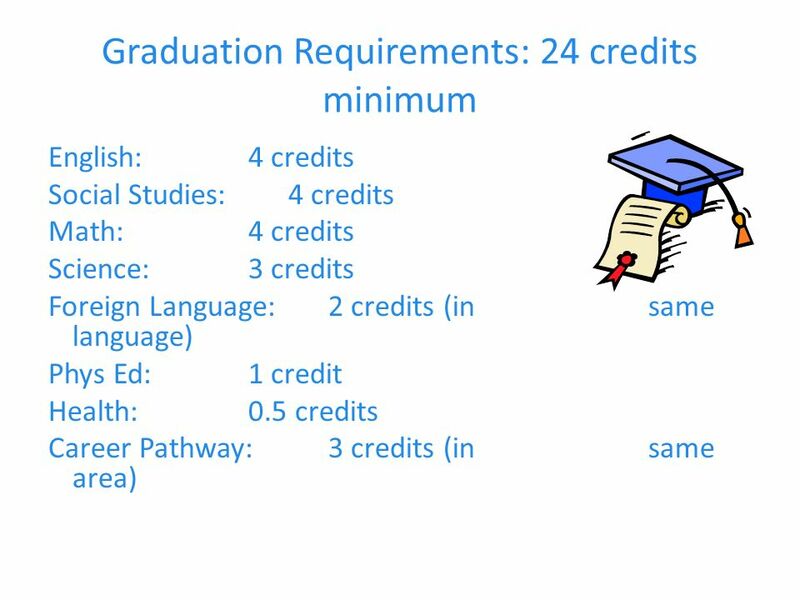 Graduation Requirements Math Pathways F.I. 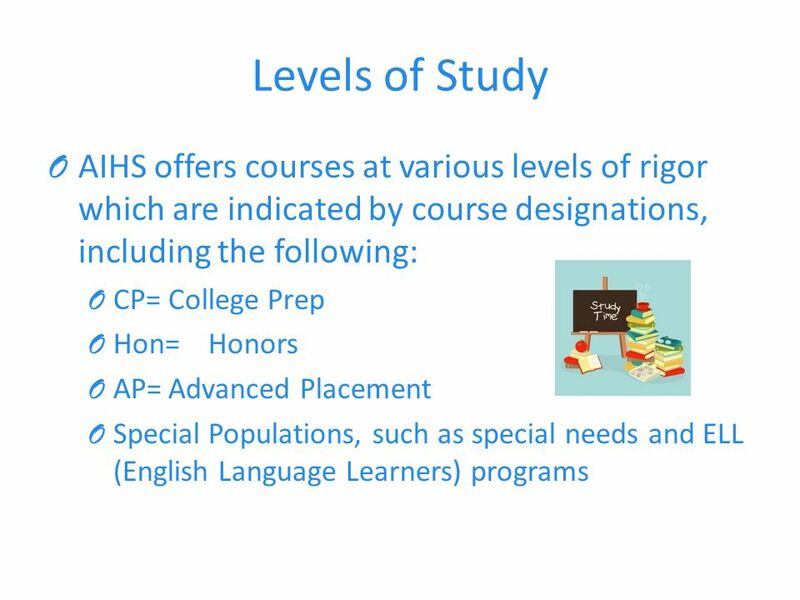 Language Arts Program/Certification Preparation for Post-Secondary Course Selection Forms for Career. 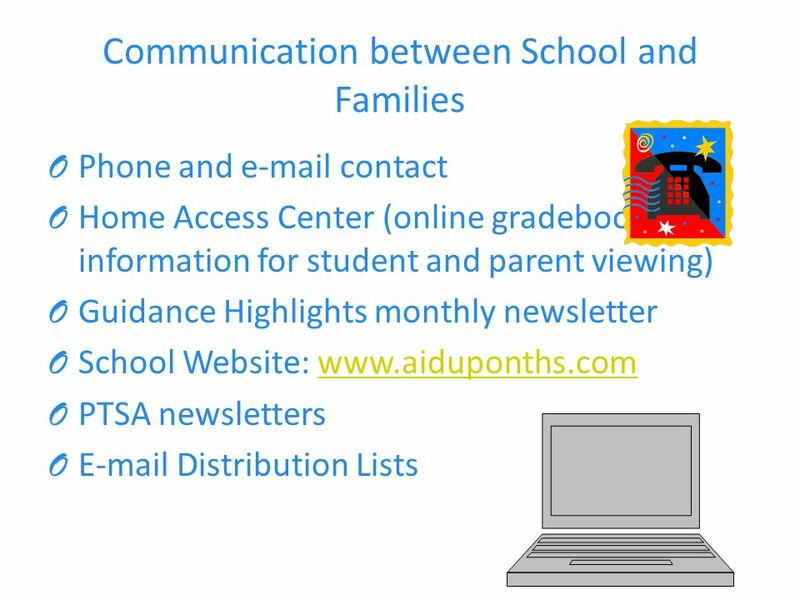 Welcome Message PHHS Overview Guidance Counselor Message Questions and Answers. Cherokee High School Woodstock High School The Class of 2017. You Should Have…  Registration booklet  Registration Form  Pen or pencil. Welcome to Marvin Ridge High School! CAREER GUIDANCE WASHINGTON. WHY DOES HIGH SCHOOL MATTER? ►Have fun ►Learn about things that interest you ►Qualify for postsecondary ►Prepare for your. 1 Torrey Pines High School Academic/Career Presentation 9 th grade students. LDHS Freshman Academy CLASS OF Why the Buzz? In other words, why is everyone so concerned about 9th graders?  The average failure rate among high. 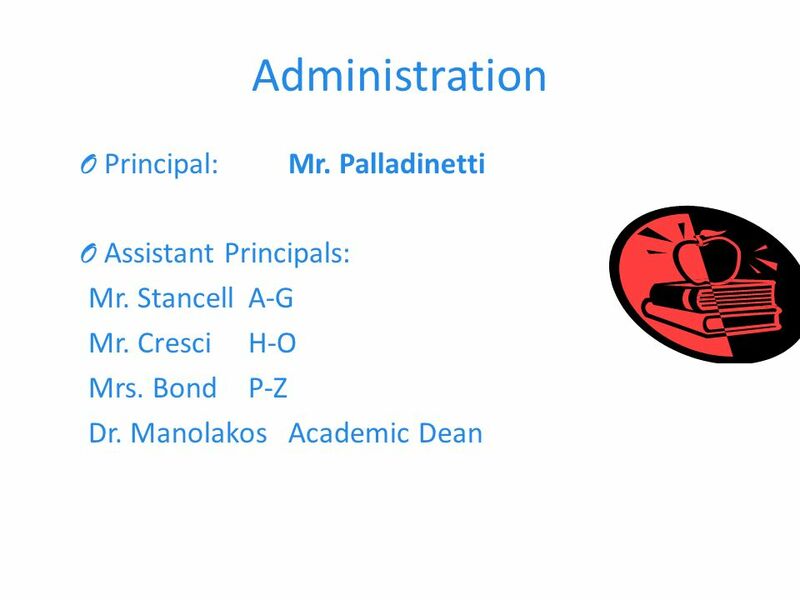 Tonight’s Presenters are: Jim Giancursio-MMS Dean of Students Stacey Allen-MMS School Counselor Jamie Farr-MMS/MHS Principal ….“YOU CAN’T HIDE THAT EAGLE. 9 TH GRADE STUDENT COUNSELING PRESENTATION P RESENTED BY : M RS. C ARTER - P ITCHFORD C OUNSELOR CODY ROOM 241 CLASS OF 2015. Freshmen Transition Program Renea P. Coley, Professional School Counselor.